Medical eyecare is an essential part of my practice. It is an engine of practice growth, so it’s important to have the best diagnostic tools in our office. For that reason, acquiring an Optovue iVue OCT was a natural fit.I invested in this piece of instrumentation because it benefits my patients and contributes to the growth and profitability of my practice. I have a 21-year-old female patient who wears contact lenses. She came in complaining of blurred vision in her eye. She thought it was a contact lens issue.I quickly determined it was not. I couldn’t exactly tell, though, upon direct exam, if anything waswrong with the macula. It looked distorted, but I wasn’t exactly sure. I acquired my OCT in the fall of 2012. 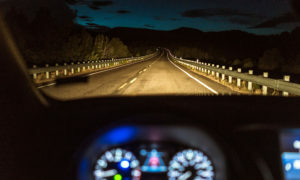 I had been utilizing mobile services for all of my glaucoma and retinal testing, and realized it was inconvenient for my patients to limit them to just one day every other month when they could have this testing completed. Optovue had a great screening option, in addition to diagnostic functions, so I knew I would be able to recoup, and then profit from, the investment. Options exist to eitherpurchase an OCT outright or do leasing/loan. The Optovue model I chose, the iVue, is $45,000. Since I had the funds, I decided to make the investment. I increased the cost of my screening retinal pictures, which are private pay, to add in the iWellness screening function through Optovue. 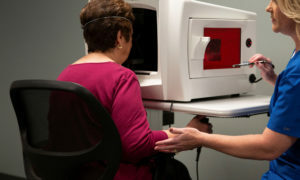 Both screening retinal pictures and the screening OCT are one fee.I worked with my Optovue rep to find a fee that worked for my practice in my area of the country. Based on just 2014 numbers, revenue alone generated from both wellness screening with Optovue and the medical diagnostic testing it helped drive, totaled approximately $15,000-$20,000. My practice sees, on average, 150-200 patients per month, and I have a relatively healthy patient base. I generate more revenue from the screening most months than the diagnostic testing. Based on these numbers, adding in 2013 revenues, and calculating for growth, I have already paid off the cost of the OCT, and am now benefiting from the revenues. iWellness is a quick and easy OCT scan that provides a single report displaying retinal thickness and GCC thickness with normative comparison and symmetry analysis. Offering the iWellness exam benefits patients and the practice. • Gain valuable information to aid in early diagnosis of ocular disease. • Create a new revenue stream to offset the cost of the OCT system. • Grow the medical practice with one fast and simple scan. • Retain patients by delivering care that protects eye health. • Differentiate the practice and increase referrals with state of the art technology and enhanced patient education. We reserve the screening OCT for those 18 and over, as that is where the normative database starts. Any patient can get retinal pictures, but those under 18 don’t get the iWellness scan, so we charge those patients 25 percent less for these pictures. We scan a child if we feel the need, or are suspicious of a problem. Editor’s Note: You can only bill medically if there is a problem (you cannot bill medically for a screening test). Beware of inadvertently committing bait and switch–telling the patient it was a screening fee of $49, finding a medical problem, and then surprising them with an upgraded fee of $150. Instead, charge the screening fee during the first visit, and then charge the medical fee on the next visit. We describe the OCT to patients as an instrument that allows us to see into the underlying layers of retinal tissue that we can’t see upon direct examination or with pictures. Therefore, it allows us to detect macular anomalies at early stages or retinal nerve fiber thinning long before vision is affected. The instrument has a very small footprint, and is smaller than most autorefractor/keratometer instruments. Optovue provided extensive training on how to use the instrument, which is very easy to use. There is also training on how to present iWellness to patients, as well as training for the doctor on data interpretation. It’s mostly run by my techs, but I also run it from time to time if needed. The ease-of-use combined with the important improvement it makes to patient care, makes the OCT a worthy investment. Having an OCT is a great way to enhance the level of care you can give your patients. I strongly recommend doctors seek this technology out!